On Sunday mornings, we meet at 1774 Queen Street East to worship God together, seek guidance and refocus our minds, hearts and spirits for the week ahead. 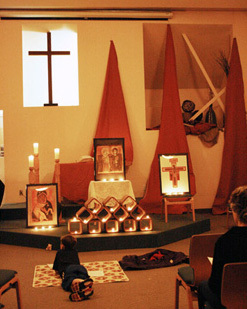 Occasionally we also conduct a Taizé-style service of prayer, song and meditation. The sanctuary set for a casual, meditative Taizé-style service, one of several special ways we worship on occasion.